So, I’m finally getting around to discussing this film, which I actually watched a couple of weeks ago. And, as expected, it did not disappoint! Quick summary: The film revolves around two friends, “Big John” McMasters(Gable) and “Square John” Sand(Tracy), and their tumultuous adventures as dreaming and scheming wildcatters. The two oilmen continue to experience the ups and downs of the industry, when Sand’s sweetheart Elizabeth “Betsy” Bartlett(Colbert) comes into town. She becomes the ultimate test to the pair’s friendship, when she and McMasters fall for each other. The rest of the film depicts the “make or break” reality of the industry, as the two friends struggle to realize their material desires. Their struggles are heightened when Sand finds out about McMaster’s extramarital relationship with a beautiful industry advisor Karen Vanmeer(Lamarr). In his eternal devotion to Betsy, Sand knocks some needed sense into his longtime friend and ultimately saves McMaster’s marriage. I realize that I didn’t detail the plot too much, but I’d rather just simply state why this film was so likeable – pardon my laziness. I feel that the loyalty motif explored in the characters’ relationships with one another really defined the film. Sand and McMasters are always seeking each other out, despite their competitive natures toward each other. Sand does whatever it takes to make Betsy happy, who in turn stands by McMasters through it all. I guess you can say that this is exactly what the film tries to reason by the end: material fortune compares nothing to the true happiness of human bonds. 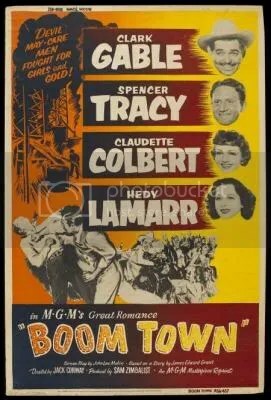 On a last note, I honestly bought this film to see some more Clark Gable yumminess, but instead ended up with a rejuvenated love for Spencer Tracy. My heart just broke for “Square John” throughout this film.